Eating out is no longer just about the food, it's also about the location, atmosphere and of course the service. We all look for the best restaurant when going out for dinner, especially when we are away from home. Photos of some of the best restaurants in St Petersburg Russia. If you're looking for a unique dining experience during your trip to St Petersburg Russia, surely you can find it! With a mixture of traditional and trendy restaurants recreating the atmosphere of Imperial Russia, the Soviet Era or modern times, when dining in St Petersburg is a sublime culinary journey that will certainly satisfy your taste buds and soul. Hungry? If so choose a restaurant from the list below. Just click on the links or scroll down to the bottom of the page. Tip: Please be sure to make a reservation before going out for dinner in any of these best St Petersburg restaurants listed here, especially on the weekend. Top-class Russian food, Different kinds of Vodka, Russian atmosphere! If you want to see or taste over 250 types of different vodka (hopefully not all at once) and feel like a Russian, Russian Vodka Room № 1 is the place to go. Split into two large rooms, one for the museum exhibition and one for the fine restaurant, this unusual and popular dining spot is one of the best in St Petersburg. Offering authentic Russian cuisine from different historical periods, here you can try delicious pre-Petrine dishes, dishes of the merchant and aristocratic classes, as well as Soviet cuisine. And, between courses, you can entertain yourself by visiting the adjacent Russian Vodka Museum, which the restaurant is named after. Feel like you're in Italy and enjoy delicious food without frills! Just a short walk from Vosstaniya Square you can eat at Caffe Italia, a charming Italian restaurant which is very popular among local young people and families. Considered one of the best St Petersburg restaurants, and one of my favorite for Italian food in the city, this is the right place to go for those looking for an authentic taste of Italian atmosphere and food. From pasta perfectly cooked "Al dente", thin pizza and toasted focaccia bread topped with cheese and Parma ham to cheese and salami with olives and much more, at Caffe Italia your palate and soul will be more than satisfied. Authentic Georgian food, Great service and fantastic traditional setting! If you are tired of pizza, sushi, borscht and stroganoff, then you should try some traditional Caucasian dishes at the popular restaurant Khochu Kharcho, which also has a rich wine list. The fantastic setting is accompanied by a wide choice of well-presented, delicious Georgian food made by chefs that know the cooking secrets of house wives from Mingrelia, a historic province in the western part of Georgia. This is a lovely place for lunch or dinner, family and business, large and small, but mainly for those who love spicy food, meat and cheese. A classical restaurant that will delight your food and wine lover's spirit! Opened by a chef and a sommelier, Vincent is one of the best restaurants in St Petersburg to linger over dinner and drinks with friends or family before heading to the popular Mariinsky theatre. Located just on the left side of Theatre square near the historical and the new stages of Mariinsky Theatre, here you can experience a list of 100 wines from all over the word, at affordable prices. The menu is not huge, but still has quite a variety of well-presented European dishes, such as tar-tars, carpaccio’s, pastas, risottos, soups and main courses. At Vincent, everything is very classical and all about the food and wine. Best Sushi in town, Cozy atmosphere, Authentic Japanese restaurant! Named after a Japanese "chicken kebab type dish", Yakitoriya is the city's first restaurant to offer authentic Japanese cuisine and service. Centrally located, this place seems to be one of the best St Petersburg restaurants for eating sushi, although you will found other similar Japanese restaurants in the city. From a huge choice of sushi to special soups and desserts, as well as some varied meals from Italian and European cuisine, here you can enjoy a relaxing atmosphere while tasting a bit of everything in a decorative and comfortable Japanese-style setting. A typical London style pub in the heart of St Petersburg, Russia! Featuring a real British pub on the first floor and a fine dining restaurant on the second floor, Dickens is the perfect place to go for those looking to combine an authentic British/Irish pub atmosphere with a posh restaurant inside a stately home. If you choose to go to the restaurant upstairs, you will be greeted by an open fire place along with giant imperial oil paintings, tall windows and candlelit tables with top class food. While if you decide to eat in the pub downstairs, then expect to eat less elaborate food in a true English pub. In both cases, the tasty large portions of food and wide list of international beer will make your dining experience memorable. Classic setting, Excellent Russian food, Top-class service! Known as one of the oldest and best St Petersburg restaurants, Palkin is a famous fine dining spot offering the very best of original Russian cuisine since 1785. An exquisite menu of refined recipes, including blini and caviar, pelmeni, sturgeon and a rack of lamb, is offered along with a flawless service and a royal atmosphere. The splendid wine selection and sumptuous interiors of the classic banquet room with a real fireplace will make your dining experience here memorable. In short, this is the place to go if you want to eat like a Tsar and have a taste of the good life. Feel like you're in France and enjoy delicious French food in a cozy atmosphere! For all lovers of French gastronomy and atmosphere, Bistrot Garcon is the place to go! This small French restaurant in the heart of the city offers delicious French dishes with a Russian twist in a unique French style setting that feels like a real Parisian bistro. From escargot, steak tartare, tournedos and hot foie gras with peaches to gourmet pastries from Pastry Chef Cebastyana Proschino, such as delicious tartlets with fresh berries, Bistrot Garcon will make you forget that you are in Russia as this place is more French then France is. Centrally located, Excellent mix of food, Beautiful rooftop terrace! One of the best St Petersburg restaurants for a memorable casual dining experience in an open terrace overlooking the main street of the city is the famous restaurant Moskva. Situated on the sixth floor of the Stockmann shopping center, right in the heart of the city, here anyone can sample a wide selection of different dishes, such as pizza, pasta, sushi, Russian classics and continental mains while enjoying a pleasant atmosphere. The decorative interiors and the view of the city from the nice terrace, along with the tasty top-class food, will make your dining experience one that you'll be talking about for weeks on end. 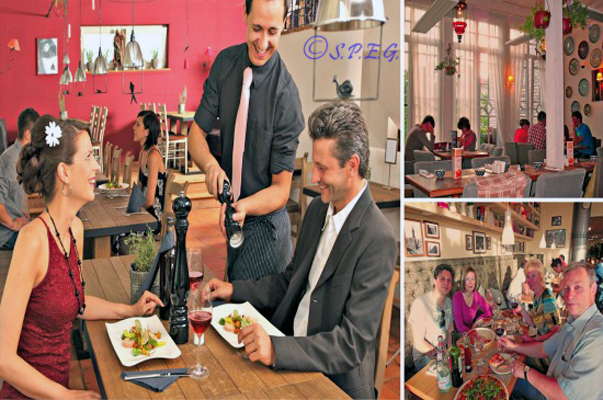 Centrally located, Great Food, Superb atmosphere! Situated in the courtyard of a block of apartments in downtown St Petersburg, you will find one of the friendiest and most cozy restaurants in the city, Teplo. This popular restaurant run by a local family offers a mix of delicious European and Russian dishes in a private house with separate rooms. If you're looking for a dining spot where you can feel as warm and comfortable as you would feel at home, and you don't mind a lively atmosphere around you, Teplo is a great dining spot that fit perfectly in our section of best St Petersburg restaurants. If you go, try the duck leg with mashed potatoes, the veal shank stewed in red wine and herb or the gammon.